Need more information about booking Home 8355238 ? contemporary style & fresh feeling design, comfortable stay with fully furnished and completely equipped. It's nice villa for a couple, a small group of family or friends. - a living room with music & video system , LCD screen TV and worldwide cable TV. - a fully equipped kitchen- with fridge,stove,microwave,toaster,coffee maker,kitchen ware,hot-cold water dispenser etc. - Two air-conditioed bedrooms with own bathroom, double bed. One is overlooking the pool and attached terrace. Outside space - dining terrace, pool deck and swimming pool. - The large terrace: providing outdoor dining table for 6-8 seates and lounge seat for 4 people , it's connected to large space of pool deck and swimming pool , having a sunbath with provided sun-beds. 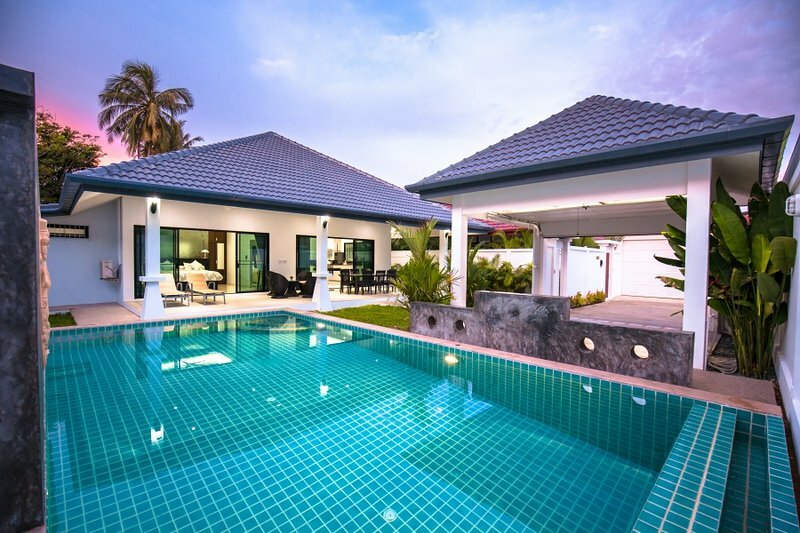 Security Deposit 12,000THB or 300 euros or any equivalent foreign currency, It will be returned after no damage in the villa.